If you read my blog regularly you know I love (LOVE) metrics. So no surprise that when River Cities Capital released an overview of SaaS operating and valuation benchmarks, I hung on every juicy detail. It’s chocked full of them – I’d highly recommend your reading the full report. But if you’re too busy for that, below are some of the key take-aways. I’ve added color commentary of my own that’s more relevant to earlier stage companies as well. The methodology here was great. They took the 92 public SaaS companies and analyzed their key operating metrics. Beyond that, they actually went back in time and looked at the earlier stage periods for these companies so we can track how some of the world’s best SaaS companies performed at revenue levels more akin to a typical Series B business. The “Rule of 40” is important. The rule of 40 is a benchmark that adds growth rate and EBIDA together. The idea is that if the addition of these two numbers is greater than 40% your business is on track. The valuation metrics show this clearly. Companies in the study that scored 40% of greater had TTM revenue multiples of 6.4x on average. Companies that scored between 20% and 40%, 5.3x, 0%-20% 3.8x and below 0% 1.9x. Healthy SaaS companies balance growth and profitability. At IPO only 7 of 39 companies that have gone publics since 2013 had positive EBITDA. More on this below, but growth is more important than profitability, subject to the balance in the rule of 40 note above. There are a ton of private SaaS financings. In 2016 there were over 2,000 financing rounds of private SaaS companies ($18.5Bn invested). Over 2,000 different firms participated in these rounds. This has contributed to companies raising more money than in the past before they go public (almost $100M on average for SaaS businesses that went public after 2011 vs. less than half that for those that went public before). It’s not clear from the study how much of this increase is going to shareholder liquidity, but clearly that’s driving some of this difference. Note in the graphic below the next point how this number has been increasing over time. The average SaaS company is now 12 years old and has over $100M in revenue at the time of their IPO . See the graphs below. Capital efficiency was not as good as I was expecting. The River Cities study measured the ratio of revenue to money raised. Not surprisingly companies raised well above their revenue level in the earlier stages as they built product and sales and marketing. The curve goes up for sure, but was lower (i.e., had a lower slope) than I expected. But note the increasing divergence between higher performing companies (3rd quartile and better) vs average. 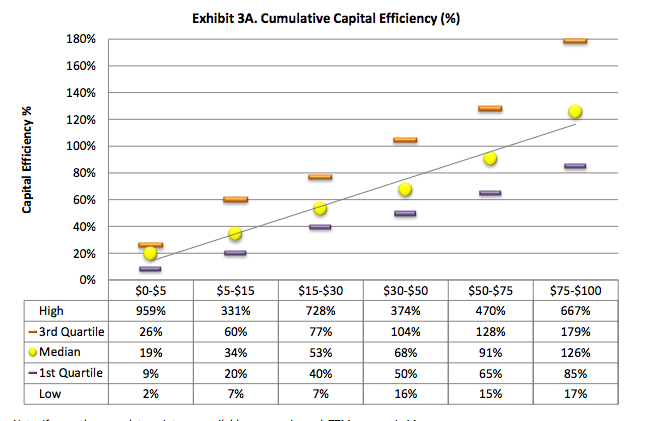 The better companies more quickly become capital efficient (in the $30-$50M revenue range) vs. their average peers. Interestingly growth and capital efficiency stats are down. Companies who went public after 2011 are less efficient with their capital and growing more slowly than their pre-2011 IPO peers. I imagine this is in part due to secondary liquidity (driving presumably by larger funds driving larger check sized into pre-IPO companies) – this counts as money invested in the capital efficiency score but in actuality doesn’t reflect money used to grow the business. This also may reflect the overall crowding of the marketplace and increased competition these businesses are facing. Growth still matters. I’ve written about the growth imperative before (and it’s counterpart the profit imperative). While not quite as crazy as it was in the fall of 205 when I wrote that first post, growth still matters. The chart below illustrates this. Interestingly at the time of IPO growth above 40% doesn’t move the needle (I’ve heard this from bankers as well before seeing these data). Top performing SaaS businesses grow quite quickly. The average public SaaS business took 6 years to go from $5M TTM revenue to over $100M (but worth noting that Concur, Ultimate Software and Vocus each took 11 years to do the same and ultimately became quite successful). Page 17 of the report digs into some additional data that felt too detailed for this summary but is worth looking at relative to the nuance of these growth rates from various revenue starting points. Not surprisingly churn matters. Ultimately churn is a drag on growth and on sales efficiency. Good SaaS businesses retain > 85% of their customers and have close to 100% revenue renewal rates when including upsell. You’ve probably heard this from your investors before, but there’s a reason for that. Sales efficiency was not as good as I expected it to be. I generally prefer CAC payback (vs LTV to CAC ratio) – especially for earlier stage businesses. And as a rule of thumb for businesses in our portfolio we target payback periods of 12 months or less. 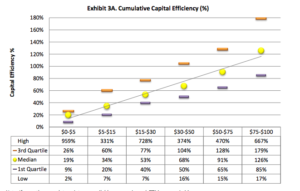 The study actually showed that these payback periods were longer than I would have expected with medians across company size closer to 24 months than to 12 (note in the graph below the meaning of quartile is flipped from the efficiency graph above). I have an upcoming post about this but a company’s ability to invest in longer payback periods relates closely to both the capital on its balance sheet and it’s access to additional capital. Verticalization. There are some interesting notes in the report about greater efficiency for vertically focused SaaS businesses which I initially found counter intuitive and are worth considering in the context of your own SaaS business. Overall the SaaS market is becoming more vertically focused as, I think, a natural reaction to specialization in the industry (not to mention crowding in the marketplace as companies seek more specific niches for their products). 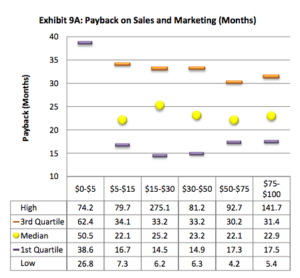 Hopefully the benchmarks I summarized here will be helpful to you as you think about your own business’ trajectory relative to your peers. Again, I’d urge you to read the full report as River Cities did a really nice job of analyzing a large data set and presenting the information in an easily digestible format.